Commenting on difficulty level of a particular season’s schedule is silly. If the Bears are the team many expect – a team contending for the title – nobody on their schedule should frighten them, in any building. The Bears are good. Good teams beat other good teams. But here are my thoughts on how the schedule shook out. In the Evening Hours. Those of us who love the early Sunday game knew this schedule was going to break the wrong way. The NFL has been hungry for a good Bears team for years and they’re going to put them in front of a national audience every single chance they get. The First Five. The Bears will be home to the Packers and Vikings, at the Broncos and Redskins and playing the Raiders in London. The natural reaction to this stretch is “the Bears should be no worse than 4-1 to start the year”. 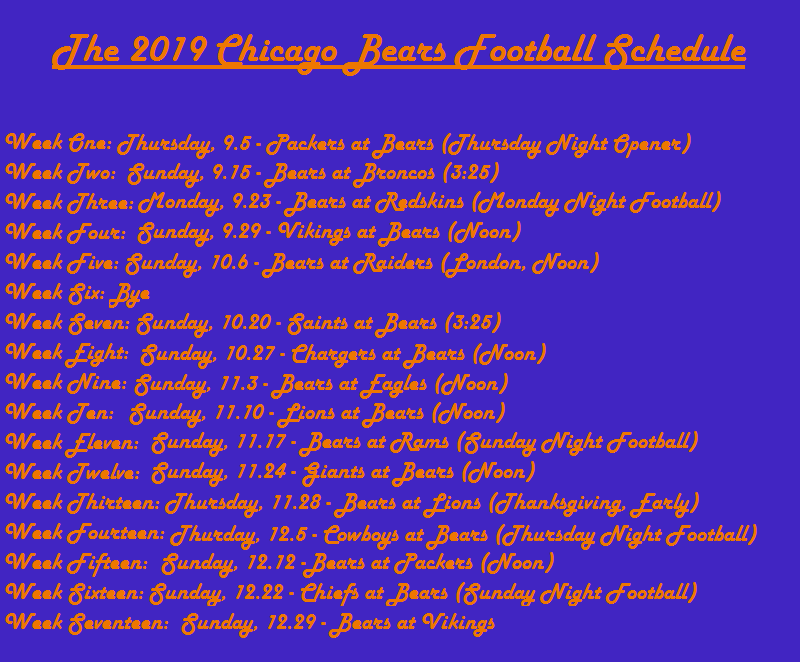 But more to the point, the Bears won’t be underdogs in any of these games (barring something bad happening this summer). It’s not a difficult start. Bye Before Saints. If the Bears want to be in the Super Bowl next season, the Saints will certainly be in their way. Well, the Saints are on their schedule and the Bears will have two weeks to prepare for them. If the Bears don’t knock New Orleans off under these circumstances, and at home, they can’t expect to have the NFC playoffs come through Soldier Field. The Middle Bit. Chargers, Eagles, Lions, Rams Giants. Five decent teams. Three at home. These are the kinds of games that determine a season. Bears played coin flips games with New York, Philly and Detroit last year. Easy to see a few of these games coming down to a play or two. The Final Five. Tough, on paper. Lions are always good on Thanksgiving and realistically should have beaten the Bears in that spot in 2018. At Packers and Vikings are rarely a cake walk. And we’ll see what the Chiefs and Cowboys are in 2019, let alone what they are in the cold, primetime, Chicago air.